A little over a year ago, I felt completely hopeless about my business. I started each day with a pit in my stomach and went to sleep each night with sweaty palms. Made Urban was a failing business and I didn’t know what to do. I had one big light bulb moment that turned my failing business around and finally got me on the right path. Now I’m crushing the goals I set, am at a place I thought I’d NEVER be and I have total confidence in myself as a business person. If you’re feeling like you’re failing in business and are ready to give up, have a read over my story here, sharing the 5 major mistakes I made and how I would correct them if I could go back and do it all over. And then read the article below, which has the steps I followed to turn it all around and ones you might want to try if you’re feeling hopeless about your business or just an area of your business. I can remember, clear as day, the week I turned everything around with my failing business. It seemed to happen almost instantly and I contribute it all to changing my mindset. Prior to the shift in attitude, I ended every day not feeling any closer to my goals. I couldn’t wait for my husband to get home so I could complain about my day and he could hopefully offer some answers (and compassion) so I wouldn’t feel as guilty about my lack of progress. I finally made a decision that I wasn’t going to let myself go down the negativity rabbit hole and would simply put my head down and work, without doubting, questioning or complaining. It was a matter of days that I had a “light bulb moment” and completely turned my business around. The idea had been there all along and was really obvious. I had been staring at the impressive stats of the Made Urban Blog for well over a year. But because I was so focused on the lack of success the Made Urban Marketplace was experiencing, I couldn’t recognize a big and obvious opportunity in front of me. I believe mindset is everything when it comes to succeeding in business and life. There are multiple studies proving a positive mind can produce positive results and I for one have experienced it, over and over. When you have negative thoughts, doubts or are in a bad mood, it’s sort of like having tunnel vision and being fixated on negativity. There can be lots of good stuff going on around you but you don’t even notice it because you’re so focused on what’s going wrong. Haven’t you experienced that in your life? I know when I’m driving and am in a bad mood because I’m running behind, everyone gets in my way, traffic is congested and I seem to hit every red light. When you’re feeling doubtful, stressed, frustrated or like your handmade business is failing, you’re not usually in a positive mindset and are focused on what’s going wrong and how to fix it. But if you shift your focus to something positive, you take your blinders off and start noticing opportunities, being open to new ideas and recognizing what’s going right. Your positivity doesn’t even have to stem from your business; it’s just important you’re in the right frame of mind, no matter what gets you there. It’s easy to get caught up in day-to-day tasks, work through them mindlessly (meaning you’re neither in a positive or negative mindset, you’re just kind of floating through the day) and let nagging thoughts creep in. Find a happy thought that puts you in a good mood. It may be the idea of hitting a business goal or something unrelated to business. It may also change from day to day. Sometimes my plans for the weekend or finishing up an article are enough to put me in a great mood and sometimes I need something bigger. Then put a sticky note on your sewing machine, worktable or laptop, that reminds you to check in on your frame of mind several times a day. If you’re in a bad or neutral mood, bring up the happy thought. It won’t be easy. It takes constant reminding, especially if you’re currently in the habit of beating yourself up about your business. None of us want to admit that our ideas were bad, wrong or impractical. Trust me, I did not want to give the people who doubted my idea, the satisfaction of admitting defeat. 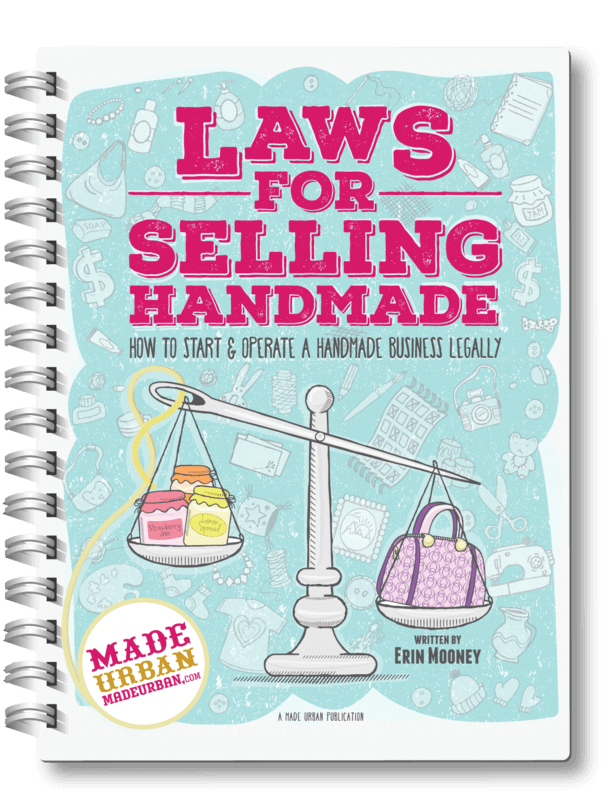 And I didn’t want to give up on my original idea of Made Urban being a thriving online marketplace for handmade products. But I could either be “right” about my original business idea and have a failing business or admit that my original ideas weren’t working and listen to the market. Although you may not agree with consumers’ opinions, at the end of the day, you need them to agree with your ideas in order for your business to succeed. If they don’t think your ideas for products or services are good enough to spend their money on, you can’t tell them they’re wrong or force them to buy. I’m not aware of a single business that didn’t have to make adjustments after launching. A business plan is not set in stone and most often, is not an accurate plan for how you’ll actually achieve success. Check in with yourself and determine if you’re simply hanging onto an idea out of stubbornness or because you’re 100% certain it’s the right way to run your business. If others don’t agree with you, in the form of spending their money, it may be a sign you need to be a little more open to making some changes. 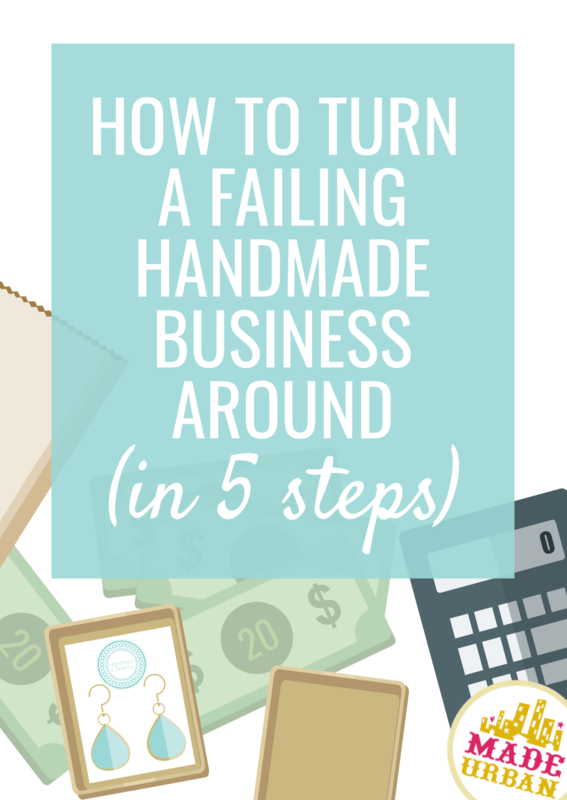 A common reason handmade businesses fail is because they’re winging it. They’re not treating it like a legit business, setting budgets, tracking numbers, increasing profits, paying themselves a proper wage, etc. You’ve gotta know your numbers! If your business is failing because you aren’t making any sales and there isn’t revenue to count, you still must know how much money you spend on your business and how much is required to operate. How many sales will it take you to break even? How many sales would be required to cover your last order from the fabric store? What are you spending on craft show fees each month? How much money are you required to collect and remit for taxes? In order to run a profitable business, you must know these things. If you’re signing up for craft shows and are only accounting for the table fee, a closer look at your numbers may make you realize the parking fees, lunches out, hours setting up and taking down, etc. are the real reason you’re not profiting and craft shows may not be a good fit for your business. Be clear on how much money you can make at a craft show before you commit to one. If you’re not aware of how much money is going out, you won’t have an accurate picture of how to price your products, how much money needs to come in or how much profit you need. Know your numbers inside and out and what it’s going to take for you to run a profitable business. Do you need to sell $1000 or $2000 in revenue to cover all your expenses and hit your profit goals? It’s a lot easier to hit a target when you know where it is. You also must know which areas of your business are the most profitable so you know what to repeat. If there’s a certain product that has high profit margins, there may be an opportunity to focus your efforts there. If there’s a marketing effort that gives you a good return on investment, more of your time should be spent on it. If there’s a sales channel you sell your products through that allows you to keep more money in your pockets, it may be beneficial to work on growing that channel. “K.I.S.S” is an acronym I’ve heard many times and can be applied to many scenarios but I first discovered it through my Visual Communications course. It stands for: Keep It Simple Silly. And keeping things simple is a great way to run a business. You have to admit, when things aren’t moving along as you hoped and you feel like your business if failing, everything feels overwhelming (even something as small as emptying the dishwasher). That overwhelm can make turning a business around feel like too big of a hill to climb and like it might just be easier to quit. Start by determining which area is causing a clog in your system. Do people buy your products instantly once they discover them? If sales are low, there may be an issue with your marketing. Are you getting your products in front of lots of people but no one is buying? It could be your products need some tweaking or you may need to work on your brand to change the light in which people view your products. Have your Etsy sales all of a sudden dropped? If you previously had success, you may need to research new best practices for Etsy or look into different sales channels, such as starting your own website or branching into wholesale. If you’re not currently finding success in any area (e.g. your marketing isn’t reaching people, not many people are visiting your online or offline shop and those who do, don’t buy), then use the numbers we talked about in Step 3 to determine which area needs the most help, address that first and then move onto other areas. Once you’ve decided on the area of business to work on (products, branding, marketing or sales), then take a closer look at the components of that area. If someone says, “my car isn’t working”, it could be due to any number of things such as the tires, engine, gas tank or maybe even lost keys. If it’s determined the car isn’t working because there’s something wrong with the engine, a mechanic must narrow the problem down further. They wouldn’t simply say, “Your engine was broken and I fixed it”. They would be specific and tell you they had to replace the spark plugs or the battery. Dissect the area of your business you’re going to work on and write down all the possible things that are required for overall success and what could be wrong. Decide on one aspect within one area of your business to work on. For example, you may decide to work on Products -> Defining my ideal customer. Don’t take on too much at once and don’t overcomplicate the process. If you’re working on defining your ideal customer, you don’t have to reinvent the wheel or find a customer no one has ever thought of. Someone currently making soap for everyone and anyone might decide to go after an ideal customer who gardens because they also love to garden. The soap maker would know all the different types of flowers and vegetables that are commonly grown by urban gardeners and the common problems they face such as getting bit by mosquitos when digging around or dealing with dirt under the fingernails and toenails. Choosing one of those ideas would help the soap maker simplify who they sell to and what they sell. Focus on one area of your business at a time and one aspect within that area to keep the turnaround process simple. And when making changes to your business, keep those changes simple too. The more you add to your plate, the easier it is for you to become overwhelmed and for things to spiral out of control. Don’t guess or completely overhaul your business at once. Make decisions based on stats and make changes to one area of your business at a time so you can easily tell if a change has a positive or negative impact on your business. The change with Made Urban took effect over years, not months or weeks. I slowly started to shift my focus to the blog and trying new things to boost traffic, newsletter subscribers, revenue, etc. Revenue slowly started to trickle in from it and profits grew over time; it was not an overnight success. Even though I started moving in the right direction, stats weren’t on a constant upward climb; some changes I made would make traffic/subscribers/revenue drop. But because I was smart about making changes, made them one at a time and tracked them, I could trace back and determine why my numbers were going down and revert back. Once you’ve implemented a change, give it a chance to have an impact and then assess whether or not it’s moving the needle in the right direction. If it is, repeat it and if it isn’t, try something new. For example, if you’re working on marketing and send a newsletter that gets higher open, click and conversion rates than normal, determine what it was that created a positive outcome. Try repeating the subject line, content, call to action or the time/day you sent the email, to see if you can repeat the results. It takes time testing different variables, but once you find your magic formula, you know what to repeat and business becomes easier. Some changes take longer to see an impact than others. For example, you’ll know right away if an email campaign is successful because you see results within hours of sending it and interaction drops off after the first day. On the other hand, if you’re working on a sales channel and are trying to improve your website traffic through SEO (search engine optimization) by adding a blog, you’ll have to wait months and add several blog posts to know if your SEO tactics are working. Also, try to make changes based on inspired action. Meaning, let the excitement about certain ideas guide you. Sometimes there are tasks that don’t evoke feelings of happiness or excitement but we still have to complete them (e.g. filing taxes). And other times, a lack of excitement can signify you’re moving in the wrong direction. Stay tuned into how you feel about your business and the steps you’re taking. I’m sure you started your handmade business because you wanted enjoy your work. Keep as much of that enjoyment and excitement in your days as possible. Tell me…which areas of business are you feeling stuck in? Did this article help or motivate you? Thank you so much for this blog and Made Urban. I came across this by mistake when I was looking for local farmers markets in my area. It was a very difficult search. I am in the process of getting two products going and thought because of the isolation of my community that this would be a good way to get my products to market. Alas, not going to happen now. Even let a friend know when I found this site. Too late. TY for all your good advice. I’m so confused. I made my very first sales call on a boutique owner/buyer after cold calling and emailing my line sheet. I set out five examples of my line. She commented on one product and said the colors were too vibrant for her customers. She did find another product she liked and said she would consider for Xmas. I said I would follow up with her on the order details and ship date. I sent her one of product with a TY note for the appointment within that week asking her to communicate with me for an order. On the way out of her shop, I noted that her merchandise and inventory reflected the same color palette of my products! The result (as of yet): NO RESPONSE. Thanks for reading Janet! The Events page and Blog will be sticking around so I hope you find lots of value in them. There are many great marketplaces out there, some Canadian. You may discover some new ones from this article: https://www.madeurban.com/blog/where-sell-handmade-online/ Wishing you all the best too! Hi Char, it’s always hard to say, especially when a store owner isn’t upfront about why they don’t want to carry your products. Try to look at her store as a whole and all aspects of the products they carry. Color is just one aspect. It may have been the style, materials or branding that she felt weren’t a fit for her store. You could send her an email and let her know you would really appreciate her honest feedback to see if she’s willing to provide a little more insight. It could just be your products aren’t the right fit for her store but they may be perfect for one down the street. I approached many many stores when trying to get my products into retail outlets. In the beginning, I thought it was about quantity. But I realized it’s more important to find stores who are going after the same customer as me and have similar branding. Don’t stress too much about one store not wanting to carry your products, it happens to every business; we can’t be a fit for everyone.